Advances in navigational radio receivers installed in aircraft, the development of aeronautical charts that show the exact location of ground transmitting stations and their frequencies, along with refined flight deck instrumentation make it possible for pilots to navigate with precision to almost any point desired. Although precision in navigation is obtainable through the proper use of this equipment, beginning pilots should use this equipment to supplement navigation by visual reference to the ground (pilotage). This method provides the pilot with an effective safeguard against disorientation in the event of radio malfunction. The VOR system is present in three slightly different navigation aids (NAVAIDs): VOR, VOR/distance measuring equipment (DME)(discussed in a later section), and VORTAC. By itself it is known as a VOR, and it provides magnetic bearing information to and from the station. When DME is also installed with a VOR, the NAVAID is referred to as a VOR/DME. When military tactical air navigation (TACAN) equipment is installed with a VOR, the NAVAID is known as a VORTAC. DME is always an integral part of a VORTAC. Regardless of the type of NAVAID utilized (VOR, VOR/DME, or VORTAC), the VOR indicator behaves the same. Unless otherwise noted in this section, VOR, VOR/DME, and VORTAC NAVAIDs are all referred to hereafter as VORs. The course or radials projected from the station are referenced to MN. Therefore, a radial is defined as a line of magnetic bearing extending outward from the VOR station. Radials are identified by numbers beginning with 001, which is 1° east of MN and progress in sequence through all the degrees of a circle until reaching 360. To aid in orientation, a compass rose reference to magnetic north is superimposed on aeronautical charts at the station location. Figure 16-28. VHF transmissions follow a line-of-sight course. The useful range of certain facilities may be less than 50 miles. For further information concerning these restrictions, refer to the Communication/NAVAID Remarks in the Chart Supplement U.S. 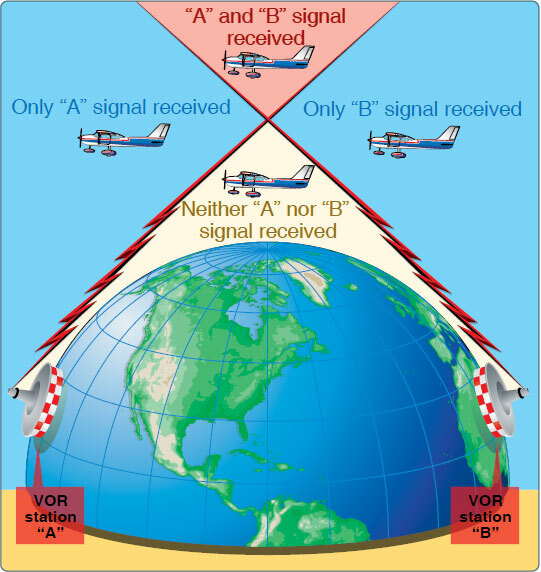 If an aircraft has two VOR receivers installed, a dual VOR receiver check can be made. To accomplish the dual receiver check, a pilot must tune both VOR receivers to the same VOR ground facility. The maximum permissible variation between the two indicated bearings is 4°. A list of the airborne and ground checkpoints is published in the Chart Supplement U.S. The VOR transmitting station can be positively identified by its Morse code identification or by a recorded voice identification that states the name of the station followed by “VOR.” Many FSSs transmit voice messages on the same frequency that the VOR operates. Voice transmissions should not be relied upon to identify stations because many FSSs remotely transmit over several omniranges that have names different from that of the transmitting FSS. If the VOR is out of service for maintenance, the coded identification is removed and not transmitted. This serves to alert pilots that this station should not be used for navigation. VOR receivers are designed with an alarm flag to indicate when signal strength is inadequate to operate the navigational equipment. This happens if the aircraft is too far from the VOR or the aircraft is too low and, therefore, is out of the line of sight of the transmitting signals.